These are super easy to make and look and taste so good! Make chocolate cupcakes (or any flavor that is your favorite) and ice with frosting. The above shows two versions one is left alone at this point and the other is now topped with coconut. Shown is a snowman melting and a full snowman for ideas. 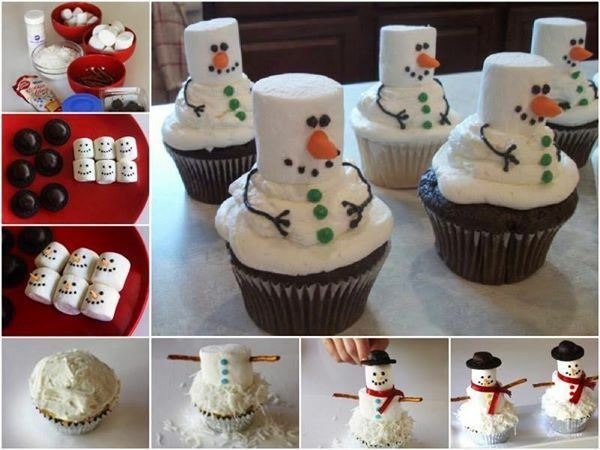 For melting snowman: Use a pretzel stick and insert into the bottom of a marshmallow and insert into cupcake. Add black icing for eyes, mouth and arms. Use green icing for buttons and orange for nose. For full snowman: Use a pretzel to join two (one small and the other large) marshmallows together and insert another one in the bottom of the largest and insert into cupcake. Top with fondant icing hat (and make one with icing). Add pretzels for arms, red liquorice for scarf. Use black icing for eyes and mouth, Orange icing for nose and blue for buttons. This is a lot of fun and the kids can help you make each one have its own individual personality. This entry was posted in Recipes, ~Holiday, ~Party, ~Snack and tagged black, blue, cake, coconut, cup, cup cake, green, icing, Liquorice, Marshmallow, orange, ~Christmas. Bookmark the permalink.